Welcome to week 2 of The Year of Happy‘s month on gratitude. The Year of Happy is a free online course in the science of happiness. Not signed up yet? Enter your email here and you’ll get a weekly dose of readings and videos to further your happiness education. Research out of the University of Minnesota suggests that our gratitude level is 40% heritable. Do you have a predisposition to gratitude, or is it something you need to deliberately cultivate? Take the Greater Good Science Center’s gratitude quiz to find out. Or better yet, take 15 minutes and complete the VIA Survey. It will rank your 24 character strengths, so you can see which ones you excel at and which need more work. These results will be useful in the later months of The Year of Happy, since you’ll also get ranked on optimism (February), kindness (April), and forgiveness (July). Below, we’ll outline different types of gratitude practices, including the gratitude visit, gratitude journal, and gratitude meditation. Be thinking about which ones resonate most with you, because at the end we’ll ask you to pick a practice for January. One of the most powerful gratitude practices is the Gratitude Visit. Although it might seem a little awkward, if you can break through your reluctance and accomplish it, you’ll be happier up to a full month later. Try to think of someone who had a significant positive impact on you whom you haven’t properly thanked. It should be someone who lives nearby, so it’s feasible for you to see them in person (hence the “Visit” part). Sit down and write them a thank-you letter, about 300 words describing how they helped you, how it made you feel, what you’re up to now, and what it means to you. Then, set up a meeting but don’t tell them why. We have stronger emotional reactions to surprises, particularly such a kind and moving surprise as this. When you visit them, read the whole letter. Don’t rush, and take time to savor their reactions to it. You’ll both find yourselves reliving the positive emotions of the past and strengthening your relationship in the present. If you can’t think of anyone to thank who lives nearby, another option is to send the letter by mail or not send it at all – but the real-life, in-person practice of gratitude will be much more powerful. If you’d like to get a flavor for what a Gratitude Visit feels like, check out this awesome video by SoulPancake. Inspired by this study, they invited participants in, tested their happiness, then asked them to write about someone who had a positive influence on their life. And then – rather than drag their camera crew around the country or across the ocean – they asked participants to call the person and read what they wrote. Some cried. Some laughed. Some did both. Everyone smiled. Then they took another happiness test. There was a 2-4% increase in happiness in people who wrote the letter but didn’t read it (for whatever reason), and a 4-19% increase in happiness for people who actually made the call. It may not be a rigorous scientific study, but hey – the guy’s wearing a white lab coat! That counts for something, right? One of the most iconic happiness-boosting strategies is the gratitude journal, which trains our brain to be alert for the positives in life. To do it, simply find a place to record good things you’re grateful for – whether it’s a physical journal or a digital document. You don’t have to share it with anyone, but the key is to actually write it down – thinking doesn’t have the same benefits. Counting your blessings is one of the most popular happiness interventions, and some individuals have recorded over 20,000 different things in their gratitude journal. In the lab, researchers have studied hundreds of people who kept gratitude journals and the results are clear: gratitude is good for your happiness, health, and more. If you think you might have trouble following through on this, sign up for the gratitude community Happier. 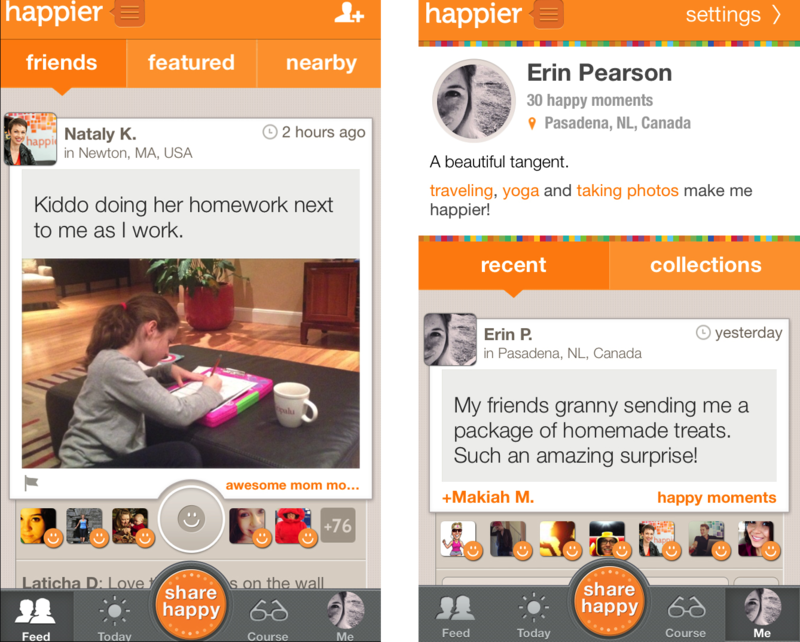 Their app is available on web, iPhone, and Android and is a place to post your happy moments and photos. All in all, it should take no longer than 10 minutes. Many people do it at night, but it’s also possible to do it at other times during the day. But you’ll have a better chance of sticking to it if you do it at the same time. You know – brush your teeth, put on your pajamas, be grateful. Gratitude prayer. There’s no formal structure to the gratitude prayer, but undoubtedly it will involve lots of thank you’s. In one study, people who prayed were more likely to achieve their goals, but only if they were also keeping a gratitude journal. Gratitude can boost our mood and inspire us to take more action toward our goals. If you have trouble praying about your gratitude, Emmons suggests praying for the ability to be grateful. Create a routine. Do it for 5-10 minutes at least every other day in the morning or evening. Take a vow. Publicly making a commitment in front of other people can help us follow through on a behavior change, because we want to avoid guilt and shame. Use grateful language. Talk about gifts, blessings, fortune, and abundance rather than deprivation, deservingness, regret, and loss. Think outside the box. Instead of just being grateful for the good things, consider being grateful for your enemies (for helping you grow) and being grateful for the people you help. Don’t worry if this sounds crazy – this is advanced gratitude! Gratitude visit: Commit to writing two or three gratitude letters this month. You can keep them to yourself, send them, or (ideally) read them in person. Research out of Kent State University studied participants who wrote multiple gratitude letters, and their happiness continued to increase after each one. Gratitude journal: Write down 3-5 things you’re grateful for anywhere from daily to weekly. It’s up to you to find your ideal rhythm, but it’s probably easier to start often (daily or near-daily) and decrease if necessary. Gratitude prayer: If you already have a habit of praying, try to introduce some gratitude into your prayers. Gratitude meditation: Find a time of day to do a gratitude meditation – the Buddhist Naikan meditation, Deepak Chopra’s meditation, or something you invent. For example, one woman wrote a poem about gratitude and then read it twice a day during meditation. It can be helpful to start the day with a gratitude meditation to put you in the right mindset. Which one did you choose? Feel free to share on our Facebook group and find out what your fellow students are practicing this month. Go back to Week 1: What is gratitude?